A properly-fitted race suit is meant to make the family jewels squeal with displeasure. It’s a fact of life, right? Right? Not any more! Alpinestars must have gotten reams of aramidic stretch paneling at a discount because they covered the updated GP Pro Race Suit in the stuff! It stretches (hah) from the collar down the sleeves, waist, and onto the legs. It allows for a snug, technical race-fitting suit to be comfy while standing straight up. Crazy, huh? You shouldn’t be standing straight up on a track bike though, so the thoroughly aggressive cut (like that of the Atem) will make sure you’re right at home in the tuck. And speaking of the tuck, the GP-Pro Race Suit features Alpinestars’ new GP style race hump. It’s thinner, more streamlined, features mesh panels, and just performs better. Just as well, the integrated DFS (Dynamic Friction Shield) armor on the shoulders and elbows make for a streamlined look, while managing to offer increased protection. This design decreases the chance of a tumble, which means you hit the ground fewer times and slide more easily. More sliding = less broken bones. And during that slide, the 1.2-1.4 race level cowhide will do most of the work for you. 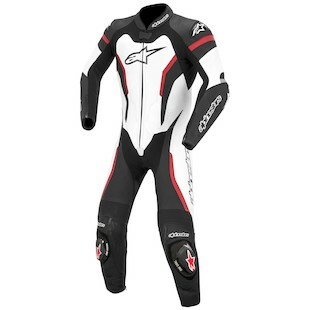 The Alpinestars GP Pro Suit delivers in the comfort department as well. On top of the stretch paneling, a full removable mesh liner will help wick sweat and keep your temperature regulated. A 3D bubble liner in the back will help facilitate air flow and also accept the Bionic Race Back Protector insert. Just as well, a neoprene collar protects your neck from unnecessary abrasion. And if leather onesies aren’t your thing, the GP Pro also comes in a (non perforated) two-piece version. 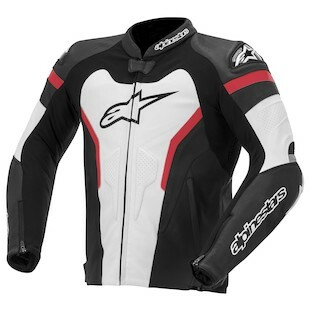 To compliment the GP Pro Race Suit, Alpinestars has also released the GP Pro Leather Jacket. With many of the same track-level features of the suit, the 270 degree zipper will allow you to mix it up with different leather pants. You could also use it on the street as a regular riding jacket. With the aggressive pre-curve though, the Alpinestars GP Pro Jacket won’t be the most casual looking article in your wardrobe. Even so, the stretch panels will make sure it’s comfy enough for scooting around town. A few added bits of reflectivity will make sure that soccer moms see you on your commute home, while the waterproof Napoleon pocket (also on the suit) will keep your valuables dry should the skies open up. It utilizes the same new DFS armor system as the suit as well, so it’ll offer plenty of protection in a slide. At a first glance, the new GP Pros look like simple color updates. Take a minute to investigate though, and there’s a whole mess of new features and improvements. The old GP Pro didn’t necessarily strike out, but it was a single at best. These though, are sure to be a home runs.